LATEST SD 5.1 SPECIFICATIONS: New SD Association SD 5.1 V30 specifications for high speed video. A1 performance allows phone applications to be executed / run directly from the memory cards. Ideal for smartphones, tablets, action cameras, 360o cameras, drones, dash cameras, camcorders, computers and laptops. Store and transfer high resolution videos, photos, music, files, documents and more. 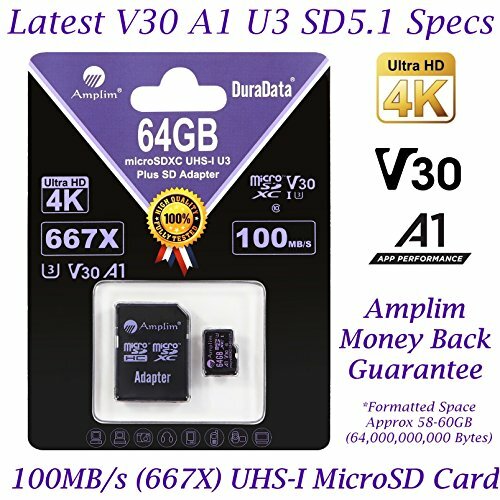 Amplim V30 A1 U3 cards are available in 128GB and 64GB. COMPATIBILITY Continued: Microsoft Surface 2 3 4 Pro LTE Surface Book Studio; Motorola Moto G6 G5 E5 E4 Play Plus X4 G5S Z2 Force Edition; HTC U12+ Desire 12 12+ U11 EYEs life U11+ Desire 555 One X10 Bolt; Huawei Y7 Prime Y6 Y3 Mate RS P20 10 Pro Lite MediaPad M5 M3 8 10 P Smart P9 lite MateBook Nova 2; Will work with all SDXC compatible phones, computers, cameras, drones and other devices. MONEY BACK GUARANTEE: Amplim is a trusted brand and an American company. 30-Day Money Back Guarantee. 100% factory tested high performance premium cards to meet ultimate top quality. Compatible with Google Android, Chrome (Chromebooks), Microsoft Windows 7/8/10 and Apple Mac OS. Amazon Prime fast free shipping. Compatible with Verizon, AT&T, Sprint, T-Mobile, US Cellular, Unlocked and other carriers. If you have any questions about this product by Amplim, contact us by completing and submitting the form below. If you are looking for a specif part number, please include it with your message.